Year round, I have the pleasure of holding Gifted Masterpieces Workshops in the USA and in different parts of the world; however, once a year in the spring, I have the opportunity to paint with participants at the Exceptional Foundation of the Gulf Coast, located in Daphne, Al. In 2011, I painted a painting with young Joseph Gravlee for Former Alaska Governor Sarah Palin who was the guest speaker for the first fundraiser. The Exceptional Foundation of the Gulf Coast is a fantastic organization with focus on inclusion and participation in the community. 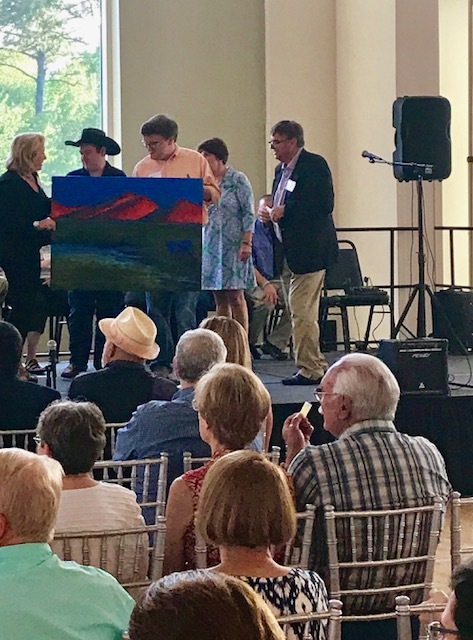 Their spring fundraiser called Exceptional Arts offers area artists the opportunity to become involved with some of the participants and create art pieces whether sculpture, paintings, etc. for sale during the event. Please enjoy the painting “Blue Steer” that Dalton (left) and Michael (right) painted. This year the focus was on two participants painting together with an artist. Our time together was filled with laughter, perspective and tons of ideas… a true creation! My heart is happy! !